This Janome Atelier 5 review will give you all the info on the latest from Janome’s computerised sewing machines. The idea behind the design of this machine is to make it suitable for all your sewing needs. 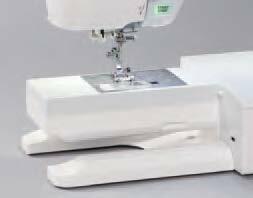 There are 3 optional kits you can purchase depending on what you use the machine for, quilting, home furnishings and fashion sewing. It comes with that all-important extra throat and added arm space perfect for larger projects. Let’s take a closer look and see if it’s worth the price tab. The Atelier 5 is fully computerised and can memorise combinations of your stitch and alphabet designs. The video below shows the memory function in action. 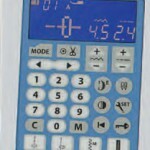 The Maximum Speed Controller lets you set the speed for comfortable sewing. 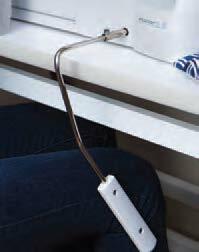 The easy to use slider allows you to easily set a slower speed for more intricate sewing such as applique and a fast speed for straight stitching. Lowest speed is 60 spm and the fastest is 100spm. A programmable needle down/up feature sets the needle to stop in the up or down position. You can set it in the down position for free motion embroidery and for easy pivoting on corners. 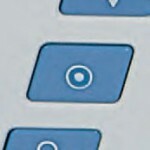 The lock stitch button means you don’t have to use the reverse stitch for securing the ends of the stitch. 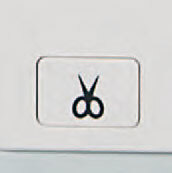 A press of the button and your ends are secured. You can sew without using the foot pedal with the start/stop button. An exclusive feature to Janome is the speed control at the start and end of your sewing. Press and hold to accelerate slowly, press and hold to slow down, then release to stop. The Janome Atelier has a generous 170 built-in stitches including the alphabet and numeric stitches. The width (up to 9mm and length (up to 5mm) of the stitches are variable and there are also 10 buttonhole style. A button is placed into the gauge of a special foot for buttonhole formation. The foot works with a sensor on the machine to create a perfectly-sized buttonhole. This creates quick, easy buttonholes of an accurate size for the button of choice. 10 built-in buttonholes, including a 9mm wide style. Your thread cutting is done by the simple push of a button. The auto thread cutter feature is conveniently placed in front of you, no need to reach for the scissors! One of the most useful features on a sewing machine for me is an automatic tension system. When selected the tension is adjusted based on the fabric thickness, great for switching between layers and fabric types. If required, you can set your own tension using the tension dial. The easy set in bobbin case and cover also features a special design where you don’t need to pull the thread tails up and through when you’re threading the machine. It has built in cutting blades for trimming the thread. This model/easyazon_link] comes with a unique 7 piece feed dog system called the “superior Feed system Plus (sFs+).” This feature ensures that the feed dogs always maintain contact with your fabric as it stays parallel when moving up and down. You can use the drop feed function when doing free motion quilting or embroidery. The presser foot can be controlled with the conveniently placed ergonomic knee lift. This means you can keep your hands on your project while raising the presser foot, great for quilting and applique work. There is also an adjustable foot pressure function, perfect for using with different fabric types and layers. The free arm feature lets you easily sew cuffs, trouser legs and tubular shapes. Because the Janome Atelier 5 comes with a horizontal full rotary hook bobbin, you no longer need to worry about the thread jamming. The clear cover lets you see when the bobbin thread is running low. 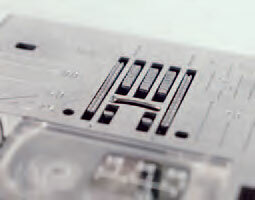 Another unique feature from Janome is the One Step™ Plate Converter. There are 2 plates included as standard accessories with this model, the normal straight stitch plate and the enhanced stitch plate. The enhanced stitch plate allows you to easily sew a small 1/4 seam. No screwdrivers are required and the internal sensor means you don’t have to worry about breaking a needle. There are a whopping 91 needle positions with the Atelier, allowing for really fine adjustments in your decorative stitch. No more headaches from working in dull light with the 6 ultra bright LED lights! These lights mean all areas of your work space are well lit. The ultra large work space 220mm x 310mm (8.70” x12.25”) with 210mm (8.25”) on the right of the needle, plenty of room for any project. It’s unusual to have such a large work area in this class of machine. The video below shows you the Atelier in action. You’ll also get a better idea of the size of the machine and how much space you would need for it in your workroom. There’s isn’t much I don’t like but think [easyazon_link identifier="B00OLNM9WY" locale="UK" tag="upcybabyclo00-21"] could have done better with the feet, which are plastic. I would have like to have seen quality metal ones on a machine in this price range. I’m not a fan of plastic bobbins either, but the machine seems to run smoothly enough with them. It’s too bulky to be portable so you won’t taking this out and about to sewing groups and friend’s houses. There’s a lot to like about this machine, it’s loaded with features and Janome has put great thought into the button placements for ease of use and the location of the ergonomic knee lift. Even though this is a large machine all areas are well lit due to the 5 LED lights. I also like the unique 7 dog feed system, great if you like experimenting with of different fabrics. I haven’t seen the One Step™ Plate Converter system before and like this addition, much easier to get those tiny seams straight! The 3 optional kits make it a versatile machine. I haven’t seen the One Step™ Plate Converter system before and like this addition, much easier to get those tiny seams straight! The 3 optional kits make it a versatile machine. This is a sturdy well built machine with some great features unique to Janome. 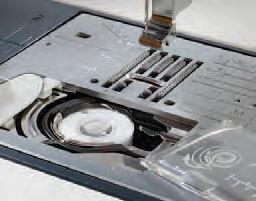 Janome are well known for building quality machines and the Janome Atelier 5 is no exception. It’s in the higher price bracket but the build reflects that. If it’s out of your price range you might want to look at the Brother cs6000i Computerized Sewing Machine. My mother mentioned that she might get back into sewing again, since she is retired now. The Janome Atelier looks like it’s got it all. Do you know if you can use the old metal bobbins and feet from another sewing machine? She wouldn’t have a problem with moving this sewing machine, because she wouldn’t be taking it anywhere. Not all bobbins and feet are interchangable between sewing machines. What make and age of sewing machine attachments does your Mum already have? There are too many variables for me to be able to answer, however, because I use a lot of recycled fabrics I can make things very cheaply. When you start buying new fabric it can get more expensive, but as you say, there’s nothing like the satisfaction of making your own clothes. The Janome Atelier 5 makes the job much easier, it’s an excellent sewing machine. Your review on the Janome Atelier 5 shows some great features more than I’ve seen in past machines. I have owned quite a few sewing machines in the past, but none of them as advanced as this . It just goes to show the difference in capabilities of older sewing machines and price to what you can have to work with today. Hi Travis, I agree, sewing machines are becoming more and more sophisticated! Many of the older sewing machines were solidly built, but didn’t have the computing capabilities we see on a higher end machine like the Janome Atelier 5. I wonder what we’ll see next, voice controlled machines perhaps?! Hi Kathy. This looks like a very impressive machine. I have been thinking about quilting for a while now – I know, a bit strange for a man perhaps!! I have one question if I may? Is this particular machine too complicated to operate for a novice machinist? I have seen the video but would like some confirmation please? Without meaning to sound sexist, in general, men tend to pick up using machinery quicker than women. I know my late hubby did, he always kept me right whenever I was trying out a new sewing machine! If you haven’t used a sewing machine there will be a learning curve, but that would be the same with any machine. The Janome Atelier 5 isn’t complicated to use and it’s one of the things I like about it. I should add, there are plenty of men taking up sewing and I’ve seena few websites speicifially for men and sewing! Great post! I think we corresponded a while ago about sewing tables for my smallish apartment. Anyway, I did get an old machine from my grandmother, but was thinking I might upgrade. Do you think that this machine would be suited for a beginner like me? I am hoping to make some cute clothes and maybe alter some of my clothes that are a bit on the big side for me now. The Janome Atelier 5, although one of the higher end sewing machines is surprisingly easy to use. If you’ve used your Grandmothers sewing machine you’ll find a budget machine won’t sew such a good stitch, these old machines are great for that! I’m a novice to making my own baby clothes, but I can do basic sewing and run a machine. How do you program your design into the Janome Atelier? Does it give you some sort of a preview on the screen so that you know what’s going to come out when it’s programmed? This would be excellent for someone that makes designed bibs and blankets to personalize baby gifts. Awesome for many etsy shops. Maybe I’ll send this to my aunt who often does baby blankets. Thanks! The first video shows you how to programme the Janome Atelier 5, once programmed you can see your selection before you sew. It is certainly a good sewing machine for monogramming and personalising baby gifts! If you’ve never used a sewing machine before then there would be a bit of a learning curve, as there would be with any new machine. The manual and DVD that come with the Janome Atelier are easy to follow, there are also lots of YouTube videos on how to use the different functions and features. Well things have certainly moved on from my childhood days – I still remember my mother sitting in front of an antique looking Singer sewing machine for hours and hours on end. The Janome Atelier really does look the ‘bees knees’ in sewing circles. Tell me, are there risks involved with using it from the safety side of things – I wouldn’t like to get my finger stuck in there!! Yes, there are some great sewing machines these days, the old Singers can still do a good job though. The Janome Atelier has a speed control so there’s no more risk than using any sewing machine. It’s surprisingly hard to get your fingers in the way of the needle! I’m sure someone somewhere will be looking into an extra attachment for tea making on a sewing machine for quilting! The Janome Atelier is a fab machine, thanks for stopping by and leaving a comment! This looks very similar to the machine my mom recently purchased, I also thought the plastic feet are a bit odd. The plus side of them is that you can see through them to see your stitching, I suppose. I really like all the features like the thread cutter and button hole maker, really makes sewing a breeze! Thanks Jolie, glad you enjoyed the Janome Atelier 5 Review, it does have some pretty neat features! A well written review and every detail have been discussed clearly. That looks like an amazing piece of machine, for the money though you’d expect it to!